Here is my second contribution to this month’s Genre Grandeur – Aliens. For this review, I chose the classic sci-fi movie Galaxy Quest which parodies Star Trek and other similar type sci-fi shows. I hope you are all starting to think about what movie(s) you plan to use for next months Genre Granduer – War which was chosen by Nial of Raging Fluff fame. 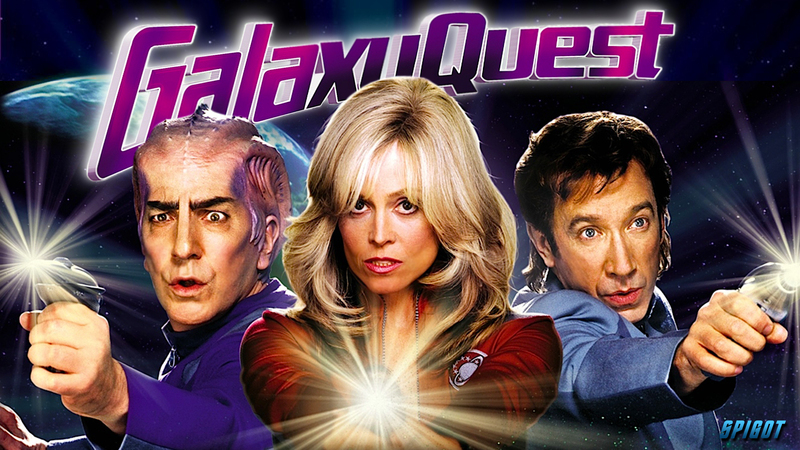 Here’s what I thought of Galaxy Quest! Brief Synopsis – A group of actors on a Star Trek-like TV show are mistaken by real aliens for being heroes who can save their species from doom. My Take on it – This movie was done so well. They took what we know about (cheesy??) sci-fi TV shows, their actors and their fans and made a hilarious movie both showcasing the pluses and also poking fun at the same time. The cast that was chosen for the crew are excellent. In addition to Tim Allen, they have Sigourney Weaver, Alan Rickman, Tony Shalhoub, Daryl Mitchell (who was tragically paralyzed not long after this movie was made) and Sam Rockwell. Enrico Colantoni is great as the leader of the aliens who think that the actors are real heroes. Justin Long is also perfect as the “trekkie” who adores the show and knows everything about it. Bottom Line – Great depiction of a parodied version of Star Trek. Amazing cast led by Tim Allen and Sigourney Weaver. Everything a sci-fi fan could look for especially since they even know how to make fun of themselves. Highly Recommended!